Grilled salmon tacos are not only delicious, they are dead simple and so quick to get on the table-only about fifteen minutes if you don’t count the time it takes the grill to heat. The jalapeño-ranch dressing that tops them is so amazing that you’ll have to resist eating it all straight from the bowl. Did I mention that I am currently obsessed with my grill. Maybe? MAYBE? Yes, yes, I think I did say that somewhere. Perhaps in my grilled naan bread pizza post? I live in Tennessee and it isn’t even officially summer here but it has been summer-hot for at least a month now. Electric bill. No explanation needed. So, starting in May I go on an oven strike that usually doesn’t end until late October. I use my countertop oven whenever possible. I have exactly two baking pans that don’t fit in it so the only time I have to use it is when I am using one of those pans. Needless to say they don’t get a lot of love for the hotter half of the year. I actually wrote a post a while back about my oven strike and how to keep your kitchen cool in the summer. I’ve been looking for all sorts of things to grill on my new Weber Spirit E-210 grill (and yes, I ordered my grill from Amazon and they sent someone to put it together for me). Of course I’ve done burgers and chicken, but also pork chops, pizza, and nectarines (look for a recipe coming up soon). I have a smoker but I want to try some grill smoking and also grill roasting, which America’s Test Kitchen says is a game-changer in their book Master of the Grill, which I am currently reading like a novel. I 100% used to think that I hated salmon until I made my friend Becky’s recipe for crispy honey butter salmon, which is pretty much sweet, savory, and crispy heaven on a plate in under 20 minutes. By the way, you don’t need skin-on salmon here but I have found that the easiest way to get wild-caught skin-on salmon here in a land-locked state is frozen. I usually buy Simply Balanced salmon at Target but Becky gets hers from Whole Foods. So, here we are. I don’t hate salmon. Suddenly I decided that salmon needed to be grilled and put on tacos, and those tacos needed to be topped with jalapeñ0-ranch dressing a la Chuy’s. If you have a Chuy’s where you are, please go just to try the jalapeño-ranch dip (they bring a complimentary basket of chips with the dip to your table). If not, you are just going to have to take my word for it that this dip (which I adapted from a Modern Honey recipe is spot on. If you are using frozen salmon, make sure it is completely thawed before you grill it. Brush the salmon with oil before seasoning. You can use a simple salt and pepper seasoning if you want or you can go a little bolder with the Tajin seasoning I’ve used for my grilled salmon tacos. You can order Tajin from the Amazon link above or you can find it in the Hispanic foods section of your grocery store (I have seen it at Walmart and Publix). Even though you brushed the salmon with oil, you are still going to need a little non-stick insurance. I accomplish this by cleaning the grill once it is hot, oiling the grill, and using a piece of foil under each piece of salmon. Let the flavors of your grilled fish tacos shine by not adding too many toppings. The fish has plenty of flavor and the jalapeño-ranch will take it over the top. I kept the rest of the toppings to a minimum – just enough for a little color and flavor! I first wrote about fish tacos years ago, early in my blogging life. I got weird looks when I talked about fish tacos back then and still get them now (my dad looked at me like I had three heads when I mentioned grilled salmon tacos a few weeks ago) but I promise these are delicious and totally worth your time! Click here to save this recipe to your Pinterest grilling or seafood boards! This post contains affiliate links. This means that if you click on a link and make a purchase from Amazon, I will make a small commission. This does not affect the cost to you. For more information, please see my disclosures. Thank you for supporting my blog! To make the jalapeño-ranch dressing: Mix all the ingredients until smooth in a blender or food processor. Store in a covered bowl or a pint jar in the refrigerator until ready to use. Preheat the grill to medium high. While the grill is heating, pat the salmon dry. Brush both sides of each piece with olive oil and sprinkle evenly with Tajin seasoning or salt and pepper (season to taste; you may not use the whole tablespoon). When the grill is preheated, clean the grill with a brush. 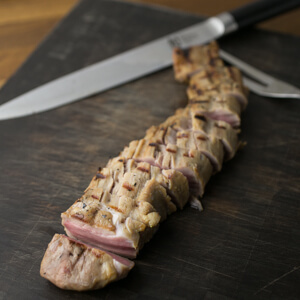 Hold a wad of paper towels using long tongs made for grilling. Dip the paper towels into the canola or vegetable oil and oil the grill grates. Lay a sheet of aluminum foil on the grill. Place the pieces of fish on the grill. Grill for four minutes, flip, and grill for another four minutes. Remove the fish from the grill. Lay the tortillas on the grill and grill for about 30 seconds per side. Remove from the grill and wrap in foil. Shred the salmon. Assemble tacos using tortillas, salmon, slaw mix, jalapeño-ranch dressing, and desired garnishes. This post has been sponsored by The Chef and His Wife as part of a direct partnership with Chattavore. As always, all opinions are my own! Scroll down for video! 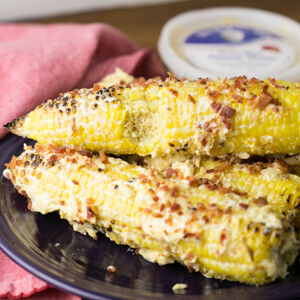 Southern street corn is loaded up with all kinds of good stuff – The Chef and His Wife pimento cheese, mayo, and bacon – for a delicious side dish! I’ve had two obsessions this summer: pimento cheese and grilling. I hope that you guys aren’t sick of either, because I’m sure not and this is probably not going to be the last post you see on here this summer featuring one or the other (or both). One of the things that I have been grilling incessantly this summer is corn. Honestly, corn on the cob is not something that I typically cook often. I’m more of an “open a bag of frozen corn” type of chick. However, when you put some fresh summer corn on the grill, well, magic happens. Everything is Better with Bacon and Cheese! Of course, if you want to amp up the magic in just about any dish, all you have to do is add some cheese and some bacon. Am I right or am I right? Yeah, that’s what I thought. The idea for Southern street corn came to me one day while I was driving, and after a little brainstorming with Philip and then later my brother I arrived at exactly what I wanted it to be. Mexican street corn is mayonnaise, Cotija cheese, paprika, cilantro, and a little lime…maybe a couple of other things. Naturally, Southern street corn would have to have pimento cheese (because what cheese is more Southern than that) and bacon. Duh. Not only have I been obsessed with pimento cheese lately, specifically I have been obsessed with the pimento cheese from The Chef and His Wife. Basically just down the street from my house, The Chef and His Wife offers lots of ready-made meals (entrees, soups, pizzas) and desserts as well as five varieties of pimento cheese (regular, smoked Gouda, jalapeño, chipotle, and blue cheese). You can order ahead online or by calling, or just come in the shop and check out their selection (they also offer space for banquets and parties). They even deliver – when you place your order you can see several options for having your order delivered to your home or for pickup at a local farmers market. I got obsessed with The Chef and His Wife’s pimento cheese after some work friends told me to pick some up at Food City – the regular, smoked Gouda, and jalapeño are available in all Chattanooga-area Food City stores (including in the Cleveland area). I love that I can support a local business when I am packing my lunch for work, and I love Chef Tim Mulderink’s story – he started The Chef and His Wife while working full-time at another job, making meals for friends on the weekends so that they wouldn’t have to cook when they got home from work at night. Six years later, he and his staff have built a great business that is thriving with the help of Chattanooga-area patrons, and they are hoping to open a second location in the not-too-far-away future. I got in touch with Chef Tim to see if he would be interested in working together, and here we are. 1) Use corn cob holders to hold the corn while you’re adding the toppings as well as when you are eating it. 2) Let the corn cool to room temperature before adding the toppings. 3) Allow the pimento cheese to warm up a little bit before attempting to spread it. I hope that you will make this Southern street corn, and if you live in the Chattanooga area, stop by to see Chef Tim in the shop or at a local farmers market (Memorial Hospital or Volkswagen on Wednesdays, Erlanger on Fridays, and The Chattanooga Market on Sundays), or pick up some The Chef and His Wife pimento cheese in the refrigerated section of your nearest Food City. The Chef and His Wife is located at 6849 Prestige Lane, Hixson, Tennessee 37343. They are open Monday – Thursday, 10 a.m. to 6 p.m., Friday, 10 a.m. to 7 p.m., and Saturday, 10 a.m. to 2 p.m. You can call them at 423.508.5823. For more information, you can check out The Chef and His Wife website or find them on Facebook, Twitter, and Instagram. Click here to save this recipe to your grilling and side dishes boards on Pinterest! While the grill is heating, take the pimento cheese out of the refrigerator and allow it to come to room temperature. Shuck the corn and brush lightly with olive oil. Grill the corn for 10 minutes, turning every 2-3 minutes. Allow the corn to cool slightly. Spread each ear of corn with mayonnaise then with pimento cheese. Sprinkle the chopped bacon all over the corn. Serve immediately. Prep/cook time does not include time to cook bacon or allow the corn to cool.